Amid massive online protests and unprecedented public engagement including more than 16 million emails, calls, and messages to lawmakers in recent months, the US Senate has passed a Congressional Review Act (CRA) resolution to block the FCC’s overwhelmingly unpopular repeal of net neutrality. The measure passed 52 to 47 with Republicans Susan Collins (R-ME), John Kennedy (R-LA), and Lisa Murkowski (R-AK) voting yes. The last minute Republican support for the measure bodes well for its chances in the House, where net neutrality supporters plan to wage a fierce battle to force a vote. “This is a historic victory for the free and open Internet, and a major step forward for the future of free expression and democracy. But we’re just getting started. 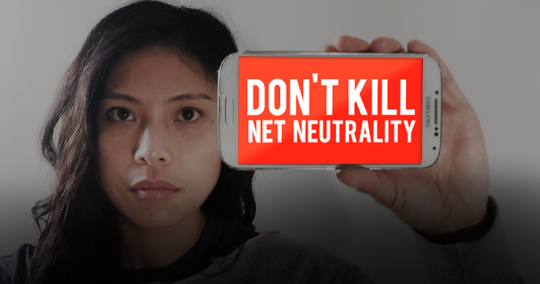 When the FCC repealed net neutrality they unleashed the fury of the Internet, and it led to a backlash unlike anything ever seen before. People from across the political spectrum, from the far left to the far right, can all agree: they don’t want their cable company to control where they get their news and information, how they listen to music, or where they can stream videos. The fight for net neutrality is about freedom. Companies like Comcast and AT&T want the power to manipulate what we see and do online. People want the freedom to choose, to connect, and to express themselves. The FCC has announced that net neutrality protections will officially end on June 11th. The Internet will surely light up in protest on that day, but the fight will continue long after that. The ISPs are pushing for bad legislation that kneecaps net neutrality while claiming to save it. Internet users will not be fooled. Now that the CRA resolution has passed the Senate, every House member has a choice to make: will they side with some of the most hated companies in America, or will they listen to the overwhelming majority of their constituents and small businesses in their districts, and vote to keep the Internet free from censorship, throttling, and expensive new fees.